Mayo’s Forgotten Famine Girls tells the story of 137 youngsters from Mayo, the majority orphans, sent to Australia from Irish workhouses 1848-50. The girls speak and through their voices we learn of their dreadful famine experiences, workhouse life, the voyage to Australia, and what became of them. Based on fact and extensive research. Leading historian Turtle Bunbury describes the book as featuring “real people, real events from the Irish Famine and how the resilience of the orphan girls shone through in the end in far away Australia”. Kennys.ie – the online bookstore of Kennys Bookshop, Galway, Ireland. Limited edition Hardback, all copies signed by author. 360 Pages. Kindle edition updated at regular intervals as research continues. Temporarily unavailable while content is being updated. 432 pages of life in the Ballina/North Mayo/West Sligo and further afield. Hardback with photos and multimedia links (QR coding) to relive the moment. Really special production with comprehensive Index. It will surprise, shock, inform and entertain the reader with a narrative covering the period of your parents and grandparents. Digital version also available to download (choose from PDF, epub and emobi). Hardback price includes postage and packaging worldwide. PRICE BUSTERS TO MAKE WAY FOR NEW BOOK. All prices include p&p. An opportunity not to be missed as prices slashed. Wonderful gift for anyone with any connection to the town of Ballina and district. 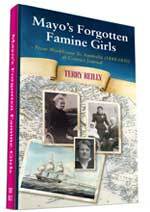 Those wishing to buy a copy of either or both of my two latest books, Mayo’s Forgotten Famine Girls -Sent to Australia 1848-50, and Ballina, One Town, Three Wars and More should avail of exceptional purchase-and-mail offer now available through www.kennys.ie ….. all for 25 euro per copy worldwide. Unbeatable! In shops book actually cost 25 euro, so postage and packing essentially comes FREE. Ideal for anyone wishing to send a copy to a friend overseas, or receive a copy themselves without having to leave own house. All copies are signed by author, Terry Reilly. Ideal for those Christmas gifts. 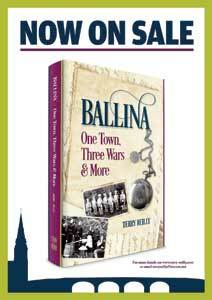 My other books are available at www.terry-reilly.com and at outlets as listed . See www.terry-reilly.com for details. Browse and buy Terry Reilly’s collection of published books, which are all available for sale via PayPal. Digital photographs of landmarks in Ballina, and surrounding regions are available from my collection, with accompanying historical text. Visit the blog of Terry Reilly and browse through a vast selection of articles on a large selection of topics. 432 pages of life in the Ballina/North Mayo/West Sligo and further afield. Hardback with photos and QR coding to relive the moment. Really special production with comprehensive Index. It will surprise, shock, inform and entertain the reader with a narrative covering the period of your parents and grandparents. 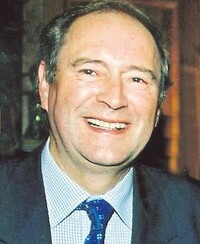 Terry Reilly is a native of Ballina, population 10,000, in North Mayo in the province of Connaught. Editor of the Western People for nearly 30 years, his first book, The Green Above The Red, (1985) written in association with the late Ivan Neill, chronicles the successes of Mayo Gaelic games. Again, rare photos as great deeds of our football heroes leap from the pages. See who’s reading On a Wing and a Prayer by Terry Reilly!! !